This precision, large open aperture (hollow core), low profile rotary stage is just 65 mm (2.559 in.) high and it's footprint is only 303 mm by 319 mm (11.929 in. by 12.559 in.) not including the motor. The rotary table of the stage has a precise pattern of threaded holes for mounting custom tooling and fixtures, and holes in the base for easy integration into new and existing applications. The diameter of the rotary table is 300 mm (11.811 in.) and the range of travel is a full 360o, and it is capable of continuous rotation. 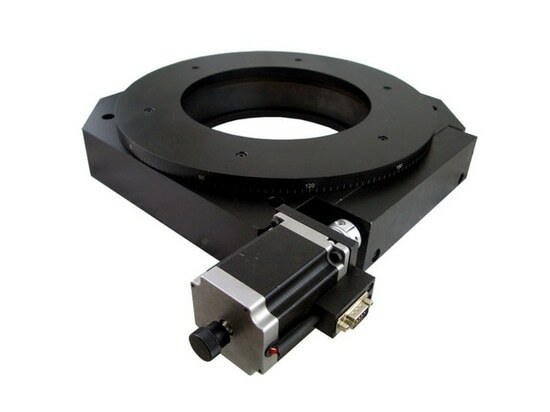 The AY110-300 Rotary Stage is also available with a servomotor and optical encoder. The standard model is equipped with stepper motor and a knob for manual adjustment which can be replaced with an optical encoder for precision position verification. 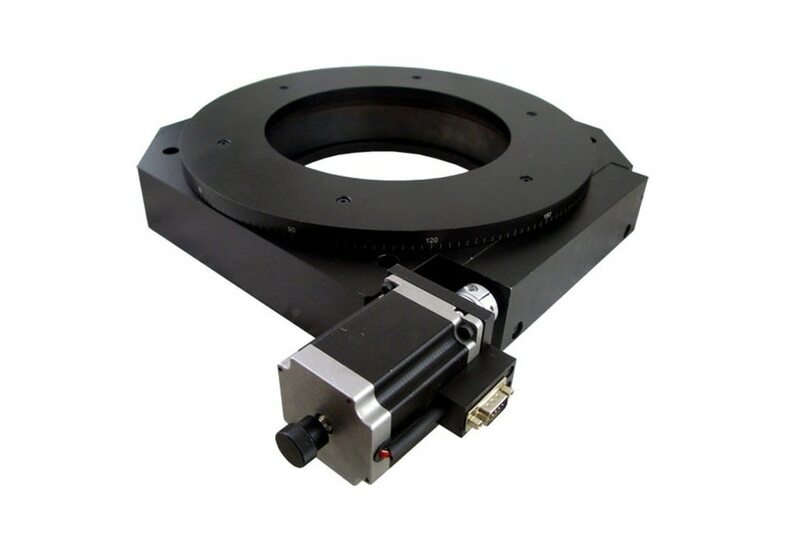 The low cost, low profile AY110-300 Rotary Stage features a very low backlash of 0.0005o, and a positional accuracy of 0.001o, making it ideal for: Laser positioning and machining, scribing, microscopy, testing, assembly, inspection, alignment, and other critical applications. This black anodized stage has a load capacity of 65Kg (143 lbs) and there is an indicator scale for visual sighting of the angle of rotation. The stage can be ordered with Plug-and-Play with a fully compatible controller from OES.